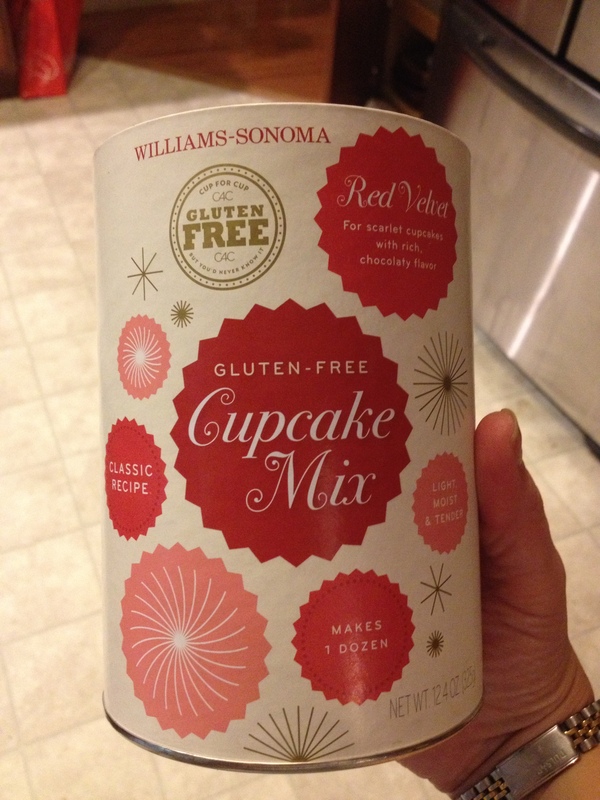 So, remember that gluten-free cupcake mix I got from Williams Sonoma? I’ve been less than impressed with gluten-free mixes in the past, but knowing the W-S quality, thought I’d at least give it a try. 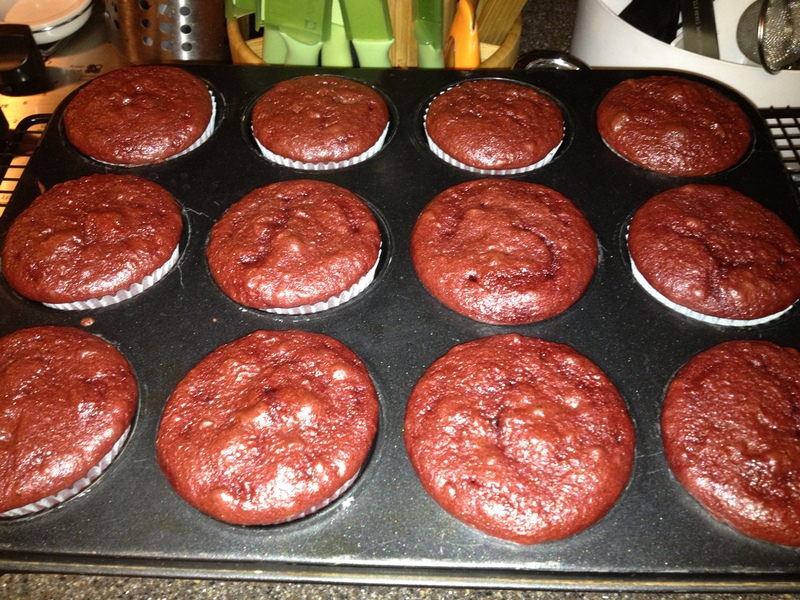 Tonight it was red velvet cupcakes…. and I learned a few valuable things. First off, contrary to normal baking, when baking gluten free you must have all ingredients at room temperature. Eggs, butter, milk…. ROOM TEMPERATURE. Then blend those ingredients well. Very well. As in 3 minutes or more well…you want a completely homogeneous mixture before you start adding the dry ingredients. The dry stuff should be added in small batches, scraping down the bowl periodically. Once it’s all combined, beat again THOROUGHLY for 3+ minutes. You wouldn’t do this with regular flour because you don’t want the gluten to develop…it makes the cake TOUGH. But gluten free flour doesn’t have that problem, and benefits from the prolonged mixing period. So, that’s what I did and I ended up with a thickened, silky smooth batter that I spooned into twelve paper lined cupcake cups. Honestly, it looked more like ketchup than any cake batter I’d ever made. 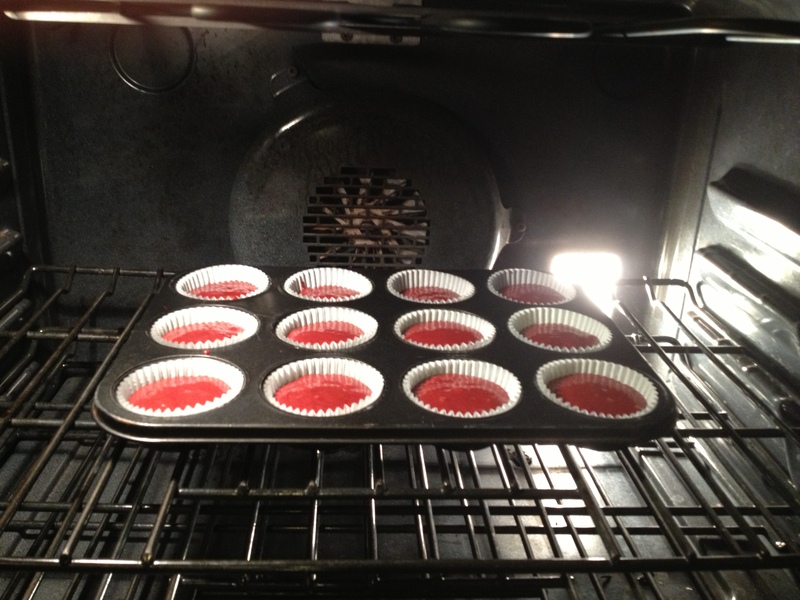 and 22 minutes later, I had cupcakes that had risen, and were PRETTY! I let the pan cool on a rack for five minutes, then pulled the cupcakes out and let them cool individually on the rack while the spouse and I ran some errands. 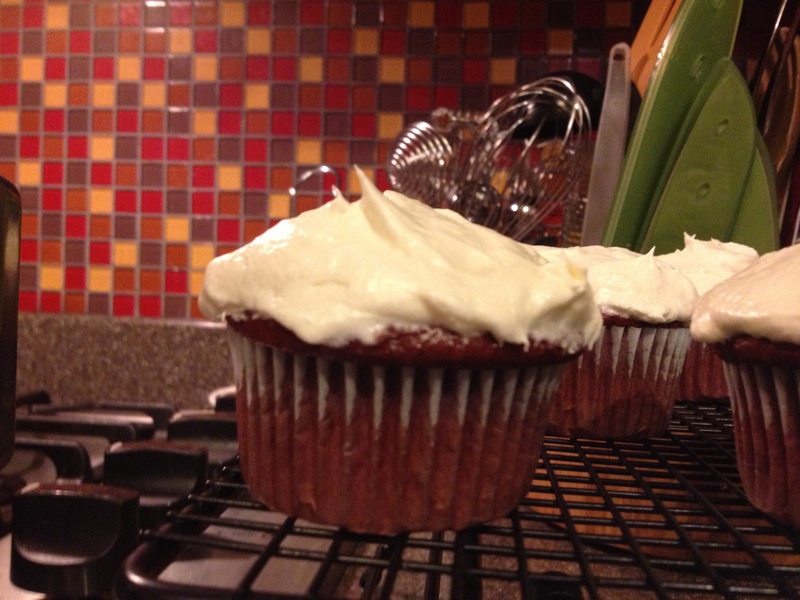 Once the cupcakes were completely cool, I mixed up some cream cheese frosting to top them off. Beat the cream cheese on medium until smooth and fluffy (about three minutes). Add the butter and beat another 3 minutes until smooth and fluffy. Add the sugar in stages, stopping to scrape down the bowl periodically… until all sugar is incorporated and there are no lumps. Finally add the teaspoon of vanilla and beat on medium until completely combined and the texture is smooth and slightly shiny. You will end up with a cream cheese frosting that is light as a cloud and not too sweet. 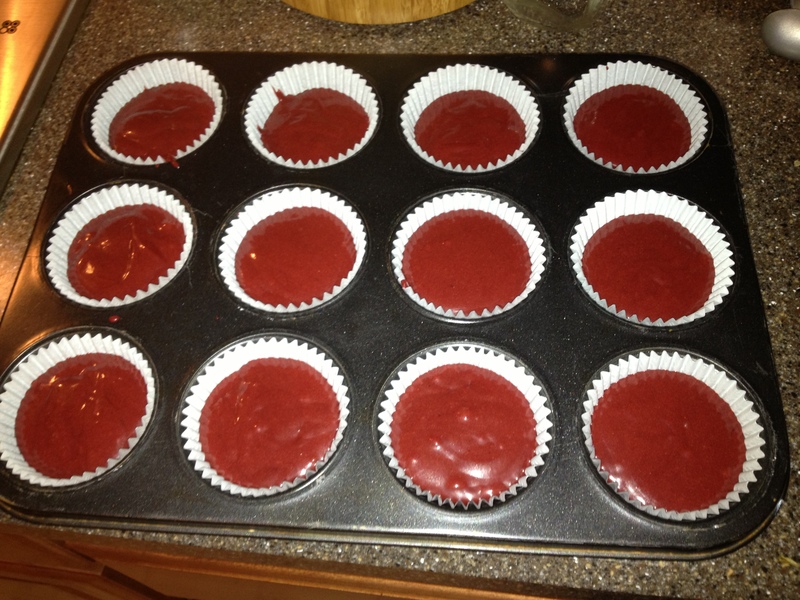 Spread on completely cooled cupcakes. Aren’t they pretty? But the final test was yet to come…. 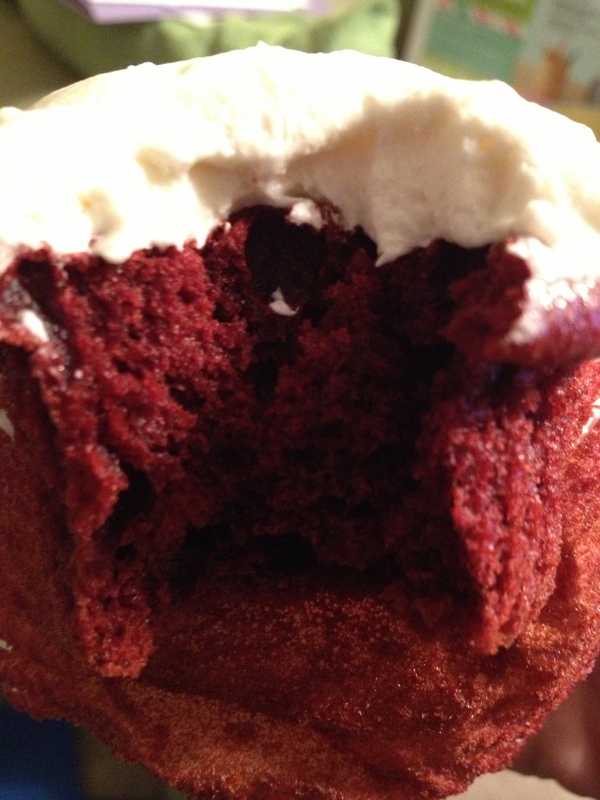 Heavens to Betsy (whoever she is) these cupcakes are DELICIOUS. The crumb is tender, the texture absolutely perfect, and the taste is richly cocoa without being overpowering. The rich taste is balanced beautifully by that light as air frosting, and I swear, this is the BEST gluten-free baked good I’ve ever made during an entire year of experimenting. These cupcakes got thumbs up from the ENTIRE family. YAY! We may actually get to experience things like birthday cake, cupcakes, and the occasional dessert now. I can’t wait. And for the record, Williams Sonoma has NO idea who I even am…I am not paid for this review, the only thing I got was delicious red velvet cupcakes after paying for my mix like anyone else. So for all you other normal folks who have to eat gluten free…. try the cupcake mix. It’s awesome!